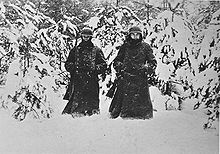 The European Winter of 1941-1942 was the coldest of the twentieth century. 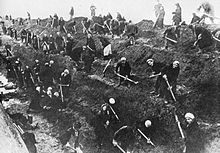 On 30 November, von Bock reported to Berlin that the temperature was −45°C (−49°F). General Erhard Raus, commander of the 6th Panzer Division, kept track of the daily mean temperature in his war diary. It shows a suddenly much colder period during 4–7 December: from −36 to −38°C (−37 to −38°F). Other temperature reports varied widely. 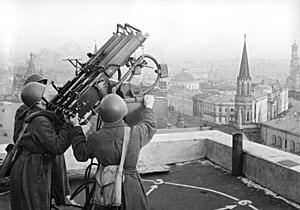 Zhukov said that November's freezing weather stayed around −7 to −10°C (+19 to +14°F) Official Soviet Meteorological Service records show the lowest December temperature reached −28.8°C (−20°F). 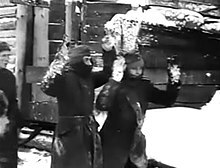 These numbers indicated severely cold conditions, and German troops were freezing with no winter clothing, using equipment that was not designed for such low temperatures. 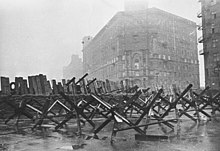 More than 130,000 cases of frostbite were reported among German soldiers. Frozen grease had to be removed from every loaded shell and vehicles had to be heated for hours before use. 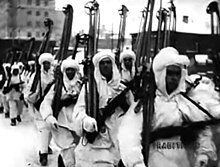 The same cold weather hit the Soviet troops, but they were better prepared. ^ Niepold, Gerd (1993). 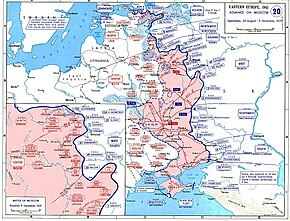 "Plan Barbarossa". In David M. Glantz (ed.). 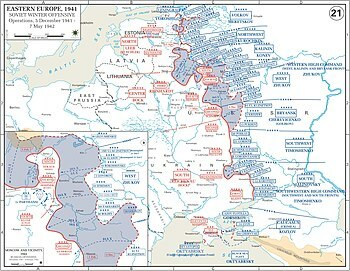 The Initial Period of War on the Eastern Front, 22 June – August 1941: Proceedings of the Fourth Art of War Symposium, Garmisch, FRG, October 1987. 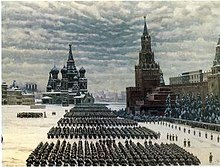 Cass series on Soviet military theory and practice. 2. Psychology Press. p. 67. ISBN 9780714633756. ^ AnydayGuide. 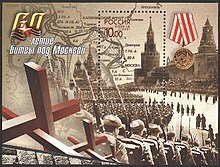 "Anniversary of the 1941 October Revolution Day Parade in Russia / November 7, 2016". AnydayGuide. Retrieved 23 October 2016. Lopukhovsky, Lev (2013). Britton Stuart (ed.). 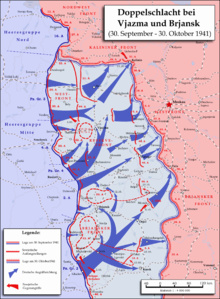 The Viaz'ma Catastrophe, 1941 The Red Army's Disastrous Stand Against Operation Typhoon. Translated by Britton Stuart. West Midlands: Helion & Company Ltd. ISBN 978-1-908916-50-1. This page was last edited on 16 April 2019, at 18:12 (UTC).